There have been a countless number of books and articles written about Ben Hogan, several of which are sitting on our shelves. Most deal with the technicalities of his golf swing (with a few asserting to have discovered his “secret”), or they are biographical in nature claiming to let us know Ben Hogan the man. But, regardless of the biographical slant, all but a couple are able to capture the real Ben Hogan. Some relate the famous Hogan stories with which all avid golf fans are familiar, but no book on Hogan reveals the caring, human side of the man the way that Kris Tschetter does. What makes this book so appealing and captivating is its warmhearted look at Hogan through a most unexpected friendship. In a perfect blending of graciousness, insight, and sports history, Tschetter has humanized the golf legend through her first work of non-fiction, Mr. Hogan, The Man I Knew. Tschetter has played on the LPGA Tour since 1988 and she joined with author Steve Eubanks for this book. With an unpretentious eye she has given us a unique and inside perspective into the soul of a larger than life golf icon. Through her eyes we find that Ben Hogan was not the cold and uncaring persona that the sports world proclaimed him to be, but a caring individual who respected the regimented and disciplined actions of a young girl striving for perfection and reached out to help. As seemingly different as two souls could be, they became kindred spirits in their quest for precision in the game of golf. How she met Mr. Hogan, how he helped her game and how she respectfully sets the record straight on a few so-called “facts” of the game is the charm of this book. While it is in part biographical, it is a heartfelt tribute to one of the greatest golfers who ever graced the fairways. Tschetter also did some digging through her pictorial archives to provide us with a few personal and priceless photos. Most interesting is a four page photo spread of Hogan's swing which Tschetter believes is the last time his swing was filmed. Mr Hogan is a gentle and brisk read uncomplicated by golf lingo and technicalities. It is a relationship story that would almost seem like great fiction if you didn't know it was true. Gentlemen golfers, give this to your wife. Lady golfers, make sure your husband reads this to see that golf is more than swinging a club at a ball. Mr. Hogan, The Man I Knew is one of my top five golf books of the year – an absolute must for all golfers to read. Jim, Great book. You will enjoy it. 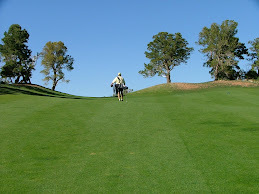 Also I have a blog dedicated to book reviews - www.golfbookreview.blogspot.com. What's up, its nice paragraph regarding media print, we all be aware of media is a wonderful source of facts.